Xenocs - Xenocs launches the New DISCOVERY MODE module - Reveal the full structure of your sample without changing sample-to-detector distance! The Discovery Mode module combines the Xenocs SWAXS module and Dectris Pilatus3 R 1M detector to provide a continuous q_range from 0.037 nm-1 up to 30.53 nm-1 in one measurement. Fig. 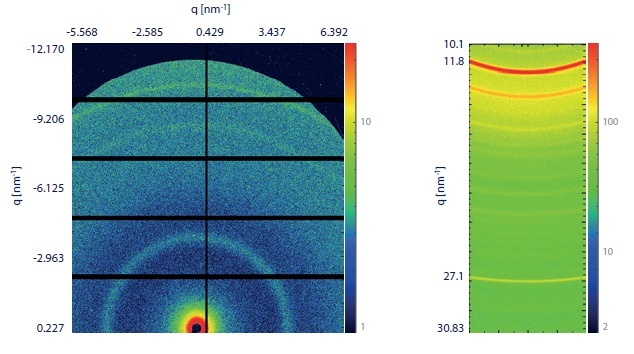 1 – 2D SAXS pattern (left - PILATUS3 R 1M detector) and 2D WAXS pattern (right - SWAXS module) from a block copolymer sample obtained at dSD SAXS = 569 mm. Exposure time = 10 min. Multi-scale structural studies up to almost 3 decades are now possible in just one measurement, thus optimizing the equipment throughput. Extending the q range beyond what is in the Discovery Mode is simply done by changing the Sample to Detector distance or by changing the source energy. For more information on the Discovery Mode, please look at the Discovery Mode technical note. For more information on the Xenocs SWAXS module, please look at the SWAXS module for Xeuss 2.0 SAXS/WAXS system note.